The risks associated with hormone replacement therapy (HRT) are varied and many, and so other remedies for hot flashes have been promoted by doctors and healthcare professionals. There are many problems associated with long-term consumption of estrogen and progesterone as part of combined hormone replacement therapy. The risks of stroke, heart attack and breast cancer are significantly increased. If you undergo estrogen treatment alone, there is still a heightened risk of stroke and endometrial cancer. Moreover, the moment you stop taking hormone replacement medication, the hot flashes may begin again. For these reasons, doctors often recommend that you consider alternative remedies if you are experiencing severe hot flashes. You may be likely experience a hot flash, a warm feeling that spread all over your body, particularly if you are undergoing menopause or perimenopause, the phase preceding it. Not all women experience hot flashes. For those who do, the reason for their occurrence, although not fully understood, is considered to be due to a decline in the production of a hormone known as estrogen. Studies indicate that about 40% of women in their forties who menstruate regularly experience hot flashes even before the onset of menopause, reasserting the suggesting that hot flashes are also a symptom of perimenopause. Alternative remedies for hot flashes that have been extensively researched since the decline in the perceived safety of Hormone Replacement Therapy. Alternative remedies include the consumption of phytoestrogens or plant estrogens, vitamin E and a herbal mix made with a plant known as ‘black cohosh’. Plant estrogens work by gently replenishing the reduced levels of naturally produced estrogen in the body. Pulses and other foods such as soy, chickpeas and lentils are naturally high in plant estrogens, and so eating these types of food is an effective way to boost levels of estrogen in the blood and alleviate symptoms of hot flashes. The black cohosh plant is commonly being used as part of a herbal mix, and is said to be successful in relieving hot flashes and other perimenopausal and menopausal symptoms. Studies have also shown that the consumption of a Vitamin E supplement can also be helpful in alleviating hot flashes. Further to this, women who are undergoing breast cancer treatment and suffer from menopausal and perimenopausal symptoms, including hot flashes, have effectively used the antidepressant Effexor, which has been prescribed as an alternative to Hormone Replacement Therapy. Natural progesterone, available as over-the-counter cream, compound prescription cream or capsule has been found to be effective in alleviating not only hot flashes, but also other symptoms related to menopause. Ensuring that a healthy lifestyle is maintained can help to manage hot flashes and menopausal symptoms. Physical exercise has also been used widely as an alternative remedy to hot flashes. Just 30 minutes of exercise every day, be that cycling, yoga, walking or swimming, can contribute to the effective management of hot flashes. Avoiding alcohol, caffeine and spicy food can also be useful. Wearing cotton clothes, especially during summer time when hot flashes worsen, will enable your skin to breathe and help reduce the number of hot flashes experienced. 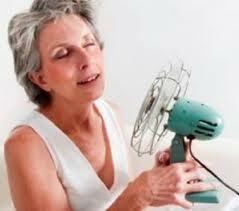 Hot flashes are unfortunately a common symptom of perimenopause and menopause. By establishing an effective combination of alternative remedies for hot flashes, it’s possible to significantly reduce symptoms and live life much more comfortably.